The list of injured Yankees is a long one full of star names and Hall of Famers, many of whom have been injured twice. Despite this, the Yankees have probably exceeded expectations as they go into the break seven games over .500 and six games behind the Boston Red Sox for the division lead. A more positive spin going forward is that the Yankees are just three games out of a wild card spot despite all of these injuries. A lot of credit must be given to manager Joe Girardi, who has managed the injuries and kept the Yankees in the race. 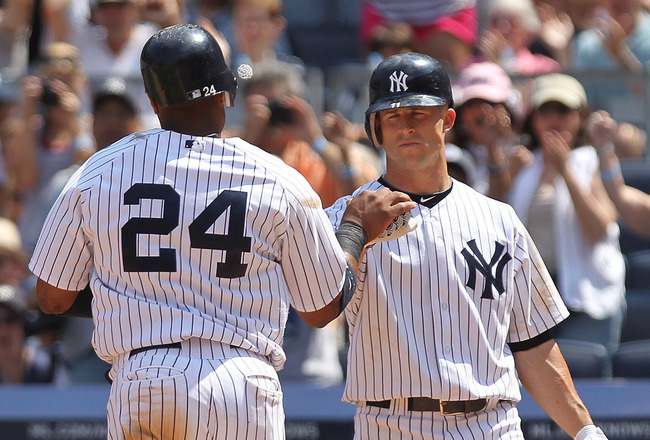 Because they are expecting players such as Derek Jeter, Curtis Granderson, and Alex Rodriguez to return, there is some hope that the Yankees can go on a run that leads them to the playoffs. For now lets look at the midseason awards for the Yankees. The Yankees’ offense has been putrid this year which has left them with one real advantage over other teams, their bullpen. The lynchpins of that bullpen have been Robertson and Rivera, who have combined to be lethal for a team that needed them to be in every way. Rivera’s numbers have been stellar as usual, racking up 30 first half saves with a 1.83 ERA while blowing just two save opportunities. Robertson has been similarly impressive with a 2.11 ERA to go along with 22 holds, good for third in all of baseball. While stats could be listed for days about these two you can really see their importance when thinking of the fact that Yankees sit seven ames over .500 with a run differential of minus two. If the Yankees can ever get their offense going they will be backed by a dominating back end of the bullpen. As great as Robertson and Rivera have been, Chamberlain has been every bit as disappointing. After showing so much promise early in his career he has really struggled to find a niche and looks closer to being out of the league than stardom. Some of this blame has to go to Yankees’ management who moved Chamberlain back and forth from the bullpen to starting early in his career. At this point he has almost no trade value and is on the last year of his contract. he has a 5.40 ERA in just over 23 innings pitched. He’s given up 29 hits in that time in addition to 13 walks. While this award could have gone to any number of Yankees batters having subpar years, Chamberlain’s disappointing road to this point has been a black mark on an already difficult season. The jury is out on whether Almonte has Major League staying power but in the absence of Curtis Granderson and the struggles of Vernon Wells, Almonte has at least provided the Yankees with a slight spark and some stability. While he is really a platoon left fielder against righties, Almonte has stuck in the lineup with a .267 average as he becomes acquainted with being in a major league lineup consistently. He got off to an especially torrid start in his fourth major league game as he went 6-10 in back to back Yankees’ victories. Almonte has shown the ability to hit to all fields, field his position well, and be a threat on the base paths. Having a young player contributing will hopefully help keep the Yankees motivated and in contention as they wait for their stars to return.